My name is Mona Pendleton and I’m honored to be a design team member of the Simon Says Stamp and Show DT. I am married to best friend Scott, I have 2 adult children, 2 teenage step children and 2 West Highland Terrier dogs. 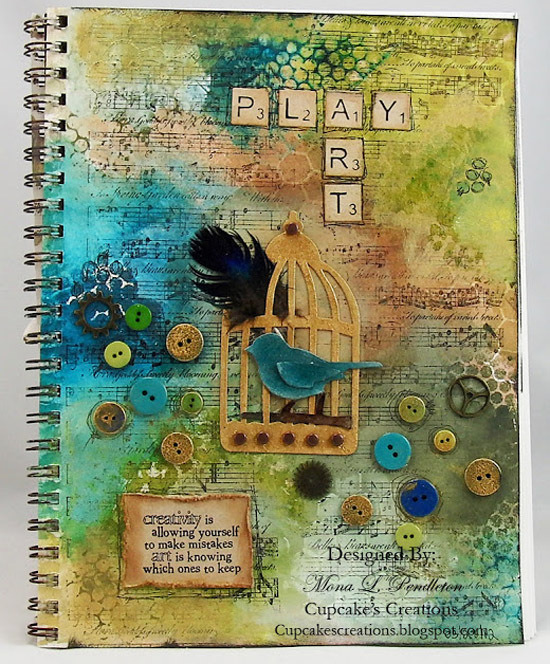 I work part-time as a Registered Nurse in the Operating Room of an Orthopedic Hospital and in my spare time, I enjoy creating just about anything including but not limited to art journal pages, scrapbook layouts, greeting cards, tags, altered art, canvases, etc. I would describe my style as Shabby. I prefer pastels but love to adventure over to the dark side occasionally as well as adding a burst of color. I can never have too many layers on most of my projects. I currently design a line of stamps, dies and stencils for My Favorite Things and have a passion simply to be creative in some fashion. Please join me in welcoming Mona to the team! 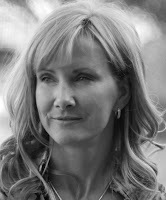 For more of her beautiful work you can check out her blog, and watch for her to join in the challenges starting July 22. And reminder: the "Anything goes" challenge is our focus this week - so be sure to enter! I'm so excited and honored to be a design team member of the talented Simon Says Stamp and Show DT! Thank you Simon Says for the opportunity! Congratulations, Mona! I'm going to LOVE seeing your creations here!!! Mona, I am very happy that you are joining us on the Design Team! Beautiful projects you shared today and can't wait for you to play along with us every week! Welcome Mona! Your work is absolutely stunning! So glad you are joining us at the SHOW! YAY!!! So happy to have you Mona!!! I've always admired Mona's work and am thrilled that she's part of your team! A FABULOUS addition to your Design Team! Mona's work is really Gorgeous and Inspiring! Wow, I've always loved, Mona's designs! She is so inspiring and will be a great addition to your team! Can't wait to see more fabulous projects! Wow, Mona is an amazing addition to your talented DT! Mona is such a wonderful addition to your talented design team! Great choice! WOW, Mona does AMAZING work! Love her shabby chic style and how she always surprises with wonderful mixed media techniques! So talented! Great job adding her to your team! Congratulations on joining the SSSaS DT, your work is beautiful, I particularly like your journal page. Look forward to seeing more of your work. Yay for Mona! She is super talented! MOna is sooooo amazing!! happy to see her (and her work) here!!! Congrats Mona! You are sooo very talented and I'm always in awe of what you create. Best wishes to you! Congrats to Mona! She is so amazingly talented! What a perfect addition to your wonderful DT! Love here mixed media designs! Beautiful designs! Mona's work is always amazing! She will be an awesome addition to your very talented team! Can't wait to see what's in store! What gorgeous designs! Mona always rocks it! Love her style! can't wait to see what else she comes up with! Great addition to your team! Congrats, Mona! 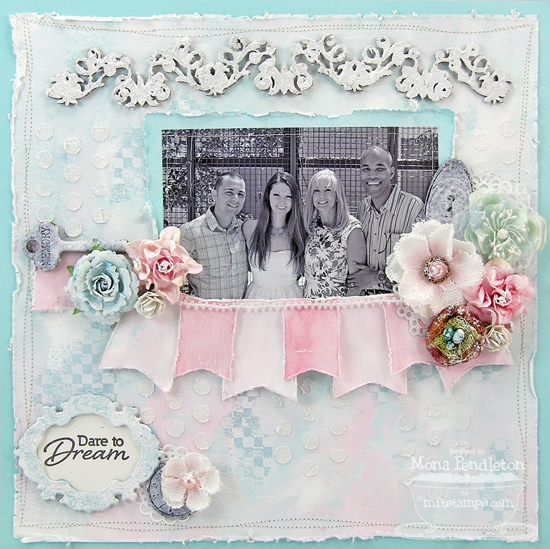 Your beautiful work is perfect for this challenge blog! Wow, great job, picking Mona to join your talented team! I've always loved her beautiful designs! Great news to hear that Mona will be joining this wonderful team! Can't wait to see all the pretty things she'll be creating! Always so inspiring! Mona is a perfect fit for your fabulous team! 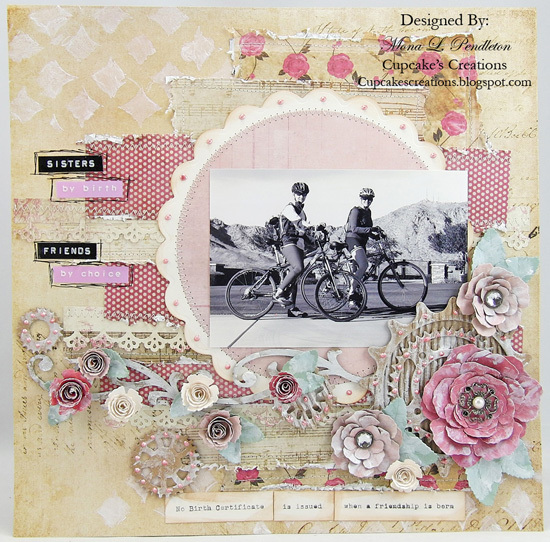 Love her shabby chic and mixed media designs!